A pod of dolphins has escaped from a recreational facility in the Japanese town of Taiji, known for its annual controversial hunts, BBC reports. Staffers from the DolphinBase centre discovered nets dividing the pools from the ocean had been slashed, allowing four dolphins to get out. An official blog said the dolphins had "stayed close to their pen" and that three returned on their own accord. Local police say they do not yet know who was behind the incident. 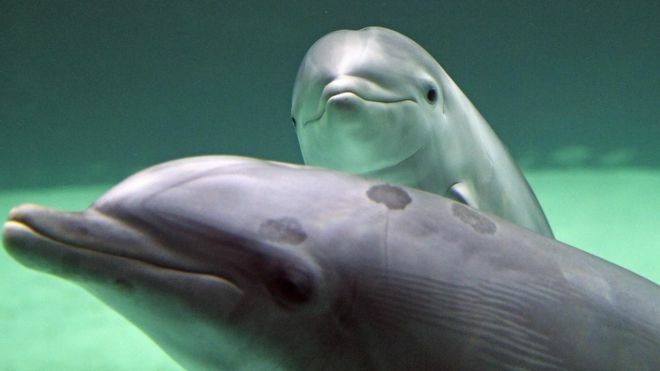 The bottlenose dolphins were estimated to be between three to five years old. They were being trained in the seaside pens having been held there for more than six months. The park would not tell the BBC whether they were wild or captive-bred. The escaped pod were spotted swimming outside their pool at the facility, where visitors can interact and swim with the animals, on Wednesday.